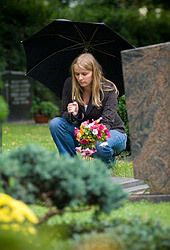 Cremation services are as unique and personal as the person you are honoring. Our staff provides many different services which are innovative and personal. 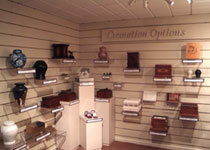 We also have a dedicated "Cremation Options" area with over 50 memorial urns, keepsake jewelry, and ceremonial containers on display. Offering families the opportunity to arrange and choose services specially designed for them will help create a more meaningful tribute. Families who choose cremation have the option of selecting a memorial urn in which the cremated remains would be placed. Our "Cremation Options" area has a wide variety of memorial urns, most of which can be inscribed with personal text such as names and dates, a favorite picture or hobby or a custom design. For a more personal touch, keepsake jewelry and keepsake urns are available if you wish to keep a small portion of cremated remains with you at all times. Scattering at sea is another option to consider and we offer both attended and unattended scattering. If attended, we arrange for up to six family members to accompany us on our own private foot vessel. The scattering can be performed in the Atlantic Ocean (weather permitting) or the Indian River Bay area. If unattended is preferred, our staff will respectfully facilitate the scattering and you will be provided a certificate showing the exact coordinates, date and time of the scattering.